We support helping and educating mesothelioma patients and family members to obtain the most up-to-date information on treatment options, and connecting them with mesothelioma treatment specialists, and experienced legal support to from experienced mesothelioma lawyers we have sent people to in each state. We also promote and support critically-needed research to develop more effective treatments and ultimately a cure. 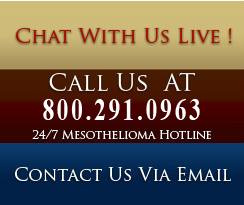 The Mesothelioma Help Center is another tool to give mesothelioma patients and their families the latest and most relevant information about mesothelioma cancer, offer hope and support, and help patients and medical professionals with quick mesothelioma answers and support to find experienced mesothelioma legal representation in your state. We encourage you to send us new information to share with our readers of new treatments and hope for mesothelioma victims. Mesothelioma is an aggressive cancer caused by asbestos. For decades, asbestos was used heavily in construction, industry, the Navy, even household products and appliances. It is still present in many homes, schools, and office buildings. The disease can arise from small exposures, and even as much as 50 years later. As a result, each year 4,000 Americans and many thousands more worldwide develop mesothelioma, and millions of us are at risk.